So here it is: my first blog post from my first country! I have come to realize that due to time constraints I will likely only do one, long (good) post per country. 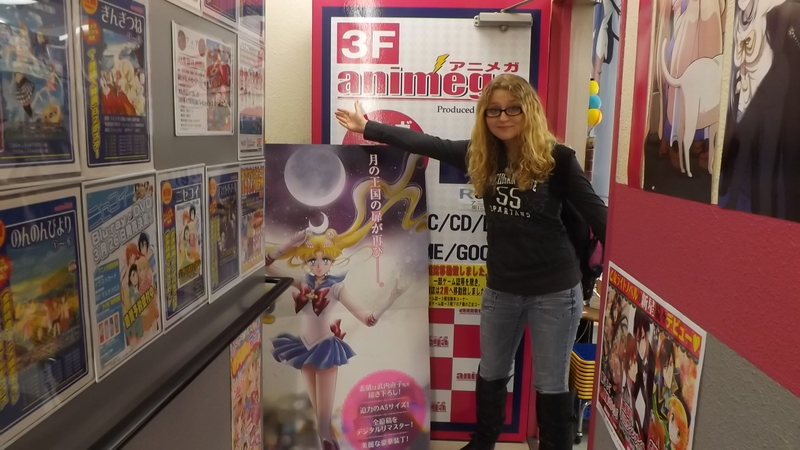 For Japan, yea, I went to Tokyo and did all the pop-culture anime-nerd stuff, and yes, I freckin LOVED every second of it! Akihabara, Shibuya, Harajuku, Karaoke…Tokyo is just a magical place! 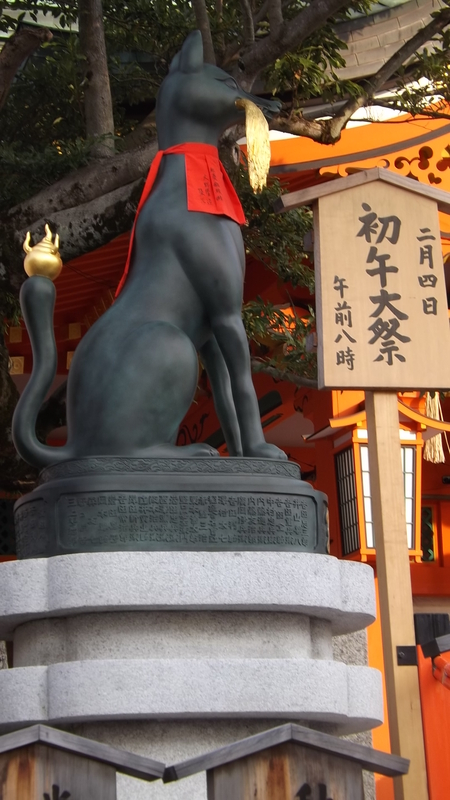 But for this blog post, I want to concentrate on Japan’s temples, food, and more historic cultural aspects. For more pictures and posts on the anime-aspect of Japan, please head over to my Instagram! After Tokyo, I realized the group I was initially traveling with wasn’t the best(for me) – so to maximize my experience in Japan I decided to head back to the ship for free food and a free place to sleep while it traveled from Yokohama (near Tokyo) to Kobe (Osaka, Kyoto area) Most people travel over-land, but for those who travel with the ship you get special privileges. For example, they showed movies in the theatre room (“union”) and offered free fine dining for dinner. 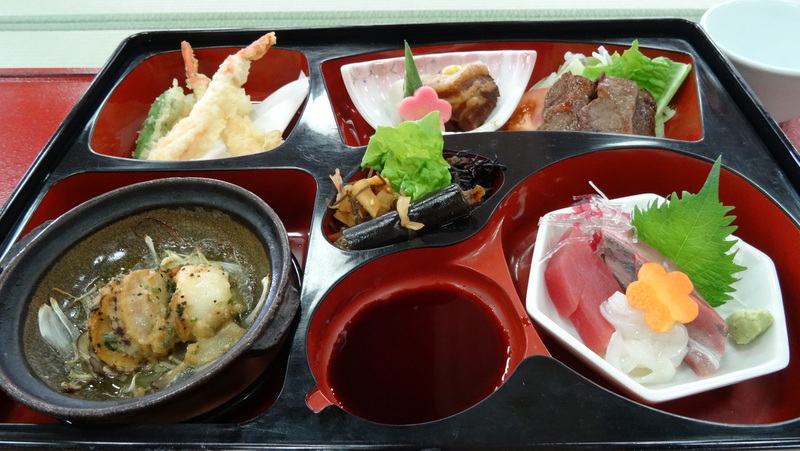 I awoke the morning as the ship ported into Kobe, and another rush of excitement took over me. When we had first arrived in Yokohama, It took all I had not to cry happy tears. “I did it! Finally! I’m in JAPAN!” It didn’t take long before I was looking for every excuse possible to use my poor, hilarious Japanese language “skills”. My Japanese is horrible, folks, but it’s just enough to get me around and have small conversations. I loved every second of it, and although lost-in-translations happened many-a-time, it was still exciting and I did pick up more Japanese. 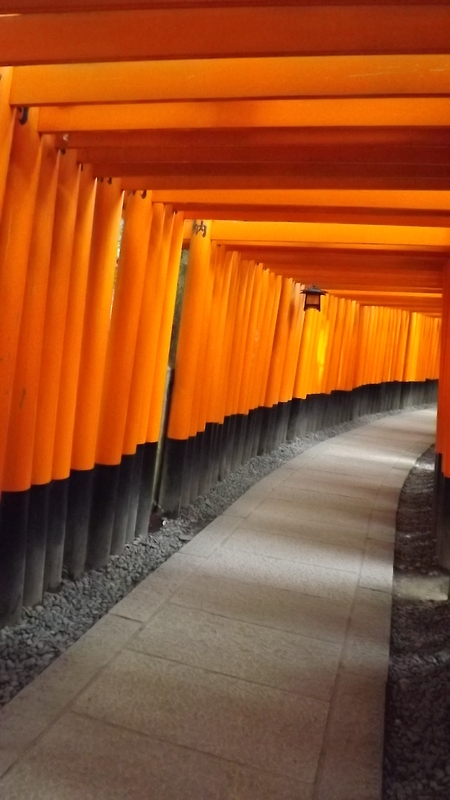 – I wasn’t in Japan 10 minutes and I vowed to return. 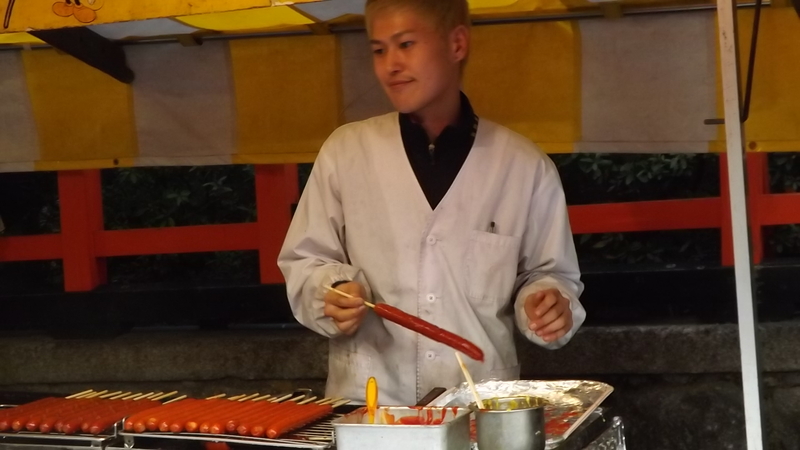 And if I may point out, Japanese people are so hospitable…I was a foreigner, clearly, but I didn’t *feel* like one. As much as I loved Korea and Morocco, I always felt like a foreigner because I was treated differently. It’s not that way in Japan. It made me feel guilty for not knowing more of the language. I met up with an amazing group of SASERS (Semester at Sea Students) and we headed Kyoto way, with absolutely no plan (minus some ideas and basic directions to some possible hot spots) One girl we were with really did her research, in a sense she was the leader of the pack during this trip, and she did an outstanding job. There was never a rush, it was laid back, relaxing, and adventurous. 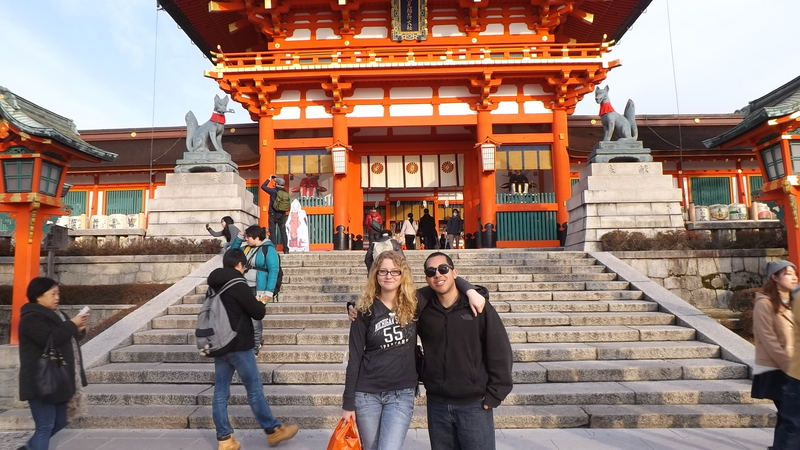 Our first stop was the Inari Temple in inner Kyoto. My heart kinda stopped here. FOXES. SACRED FOXES. EVERYWHERE. I REALLY love foxes, so I was in fox heaven. Wolves too. The temple was beautiful, huge, red, and had many amazing attractions. From food stands, to little shops, to a beautiful walk-way within the temple itself, I was just in awe. After Inari temple we headed to a crowded market place. It was a thin, extremely long strip of food stands and little shops. I sampled everything that was offered to me. 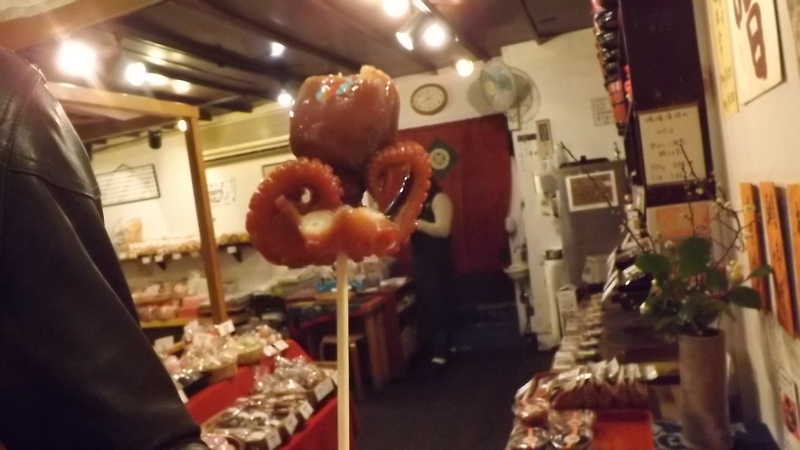 From Mochi (rice candy), dango (kinda sorta like mochi), fish heads, octopus, I was overwhelmed and after bits of sampling I was growing more and more hungry for a meal. 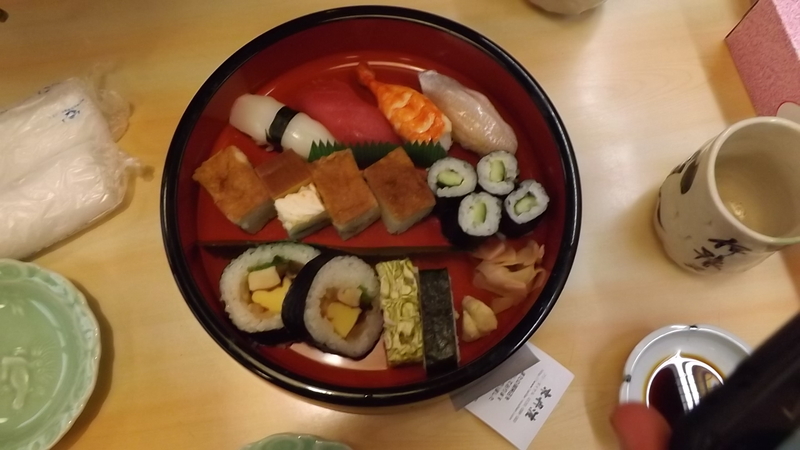 Starving and graving sushi, a SASER and I asked if we could have a sushi stop. You can go to the best Sushi joint in the U.S, I don’t care, it won’t compare to Japanese sushi. Looks the same, but the flavors are richer, stronger and just over all tastier. Expensive though…worth. Every. Penny. I mean, yen. And then I asked “So where are we sleeping tonight?” and we headed to our hostel. I was excited! I was with a group of 6, so I felt very safe, a mixture of guys and girls, and I would have my first hostel experience. I prepared myself for dirty, dangerous conditions….and then we got there. The bunk beds were clean (and sooo comfy! ), the bathrooms offered towels and soaps, the lobby offered free drinks and treats and our one roommate was a backpacker traveling Asia from Israel – and he was awesome. Okay, what was I thinking? This is Japan. One of the cleanest, safest countries in the world. Can I just move here? That night our Israeli friend took us to a little noodle place for dinner. Between 2 and 4 dollars (depending on if you got meat or not) you tell her what you want, she slides the bowl to you, and you eat quickly standing up. After eating, karoke and drinks around! And I spent like 10 bucks trying to get a Pokemon plushie at a nearby arcade. I didn’t get it….Japanese arcades are evil. So many cute prizes that I just cannot win. 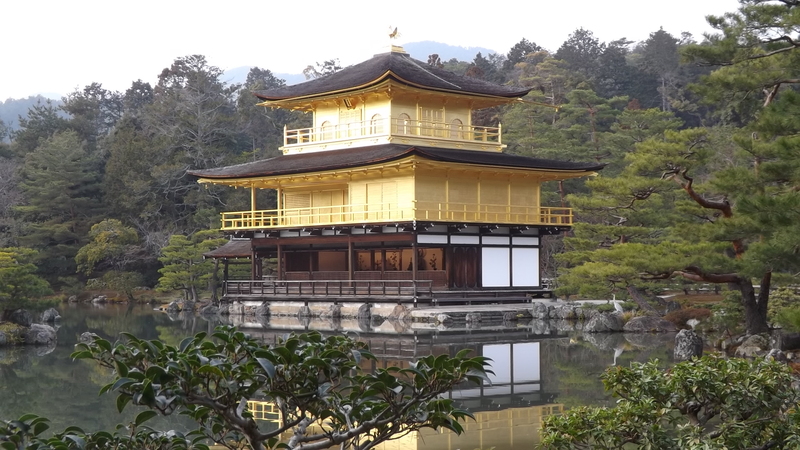 The following morning was a final breathe taking adventure – to Kinkaku-ji temple (Sorry for bad spelling) – a temple that looks as if it floats on the water. I can’t even get words to describe this, it was just so beautiful, and I got some of the best photos that I have ever taken at this place. The temple and its surrounding nature made it a hotspot for photographers. 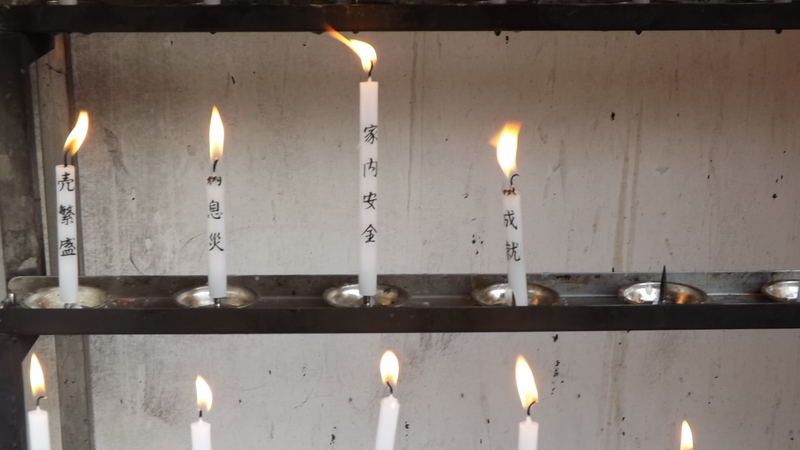 When you pass the temple you go up some stairs and at the top there are candles, Buddha and god statues, and a place to put the candles and watch them burn. But these candles were special, they read in Japanese things such as “Heart’s Desire” “Pray for cancer” “Hope for love”, you burn this candle to represent your hearts deepest wishes, and you ask Buddha to hear your desire, and hope for it to be granted. Can you imagine the emotion here? You are surrounded by so many people who are burning these candles with heavy hearts. As soon as I recognized where I was at and what people were doing, I was filled with tears. It’s beyond words. And that ends it, I held back my tears as Japan faded into the distance. In the other direction awaits China, and through the fog – Vietnam.